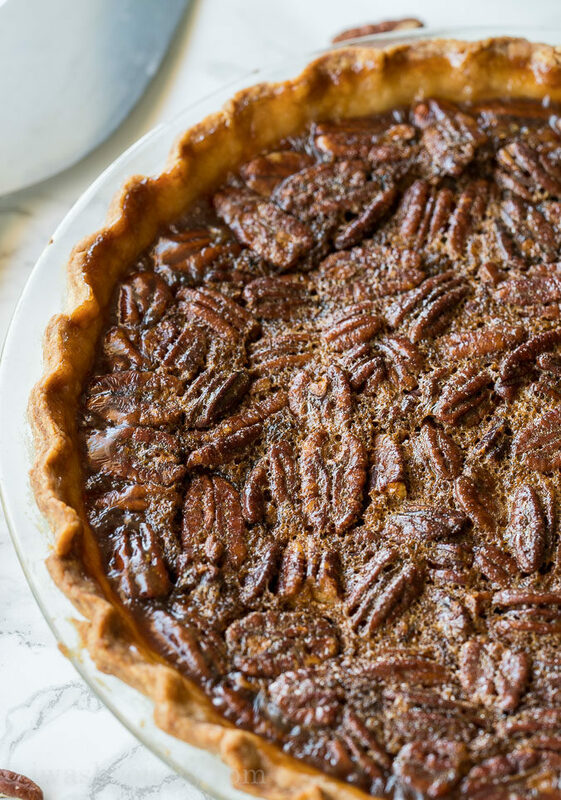 This Classic Pecan Pie Recipe is EASY to make! 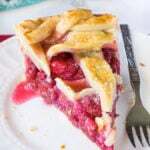 Simply mix everything together in a bowl, pour into your prepared pie crust and bake! 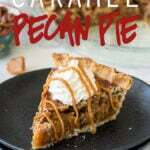 With the holiday season upon us I figured it was the best time to share my tried and true Pecan Pie recipe with you. I have been using this recipe for years, and make it at least 10 times during the holidays. 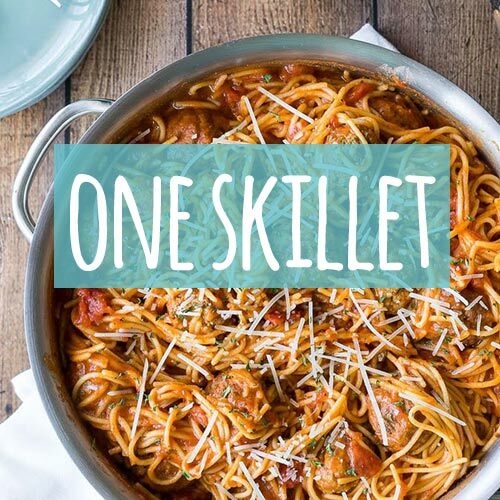 It’s one of those recipes where you just memorize the ingredients list and whip it up. My favorite thing about this recipe is that there is no pre-cooking needed. 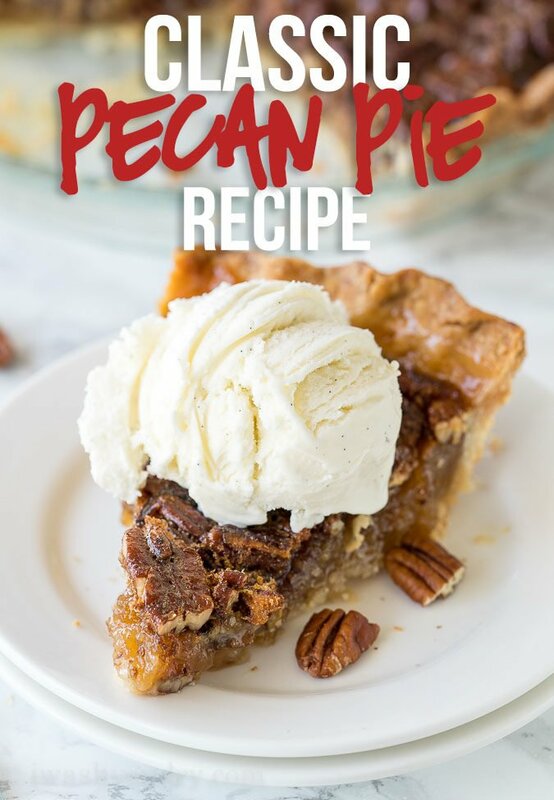 You’ll want to start out with a good pie crust recipe, then mix all the filling ingredients (minus the pecans) together with a whisk until smooth. Fold in the pecans and add them right to the uncooked pie crust. Pop it into the oven and bake! 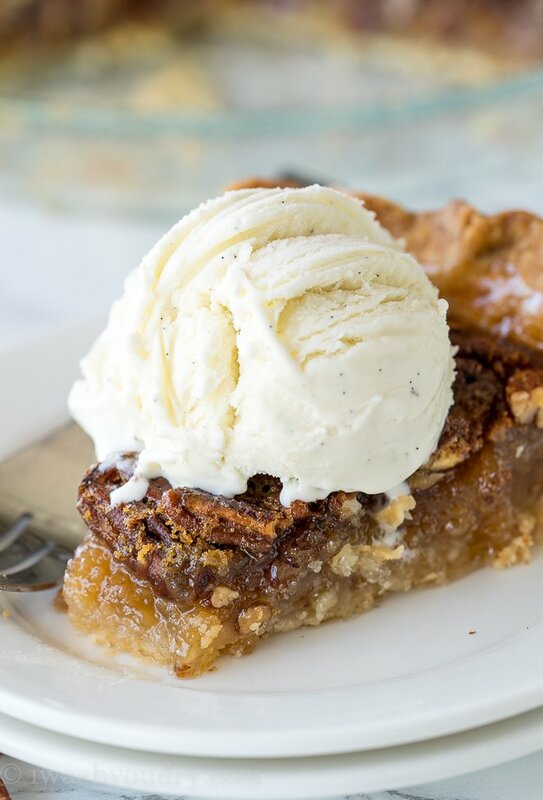 I love topping my pecan pie with a scoop of ice cream or you can use a whipped topping too. Before adding the filling to the pie crust, line the bottom with chocolate chips for a chocolate pecan pie! Try toasting your pecans before adding to the filling for an even deeper and nuttier flavor. If your pie crust is beginning to brown too quickly, lightly cover the edges of the crust with aluminum foil. 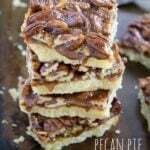 Want your Pecan Pie to be sliceable and not fall apart? Make sure you’re cooking it till the center is only slightly jiggly, and let it cool to room temperature before slicing. She’s right!! We shouldn’t reserve this deliciousness for just the last few months of the year. 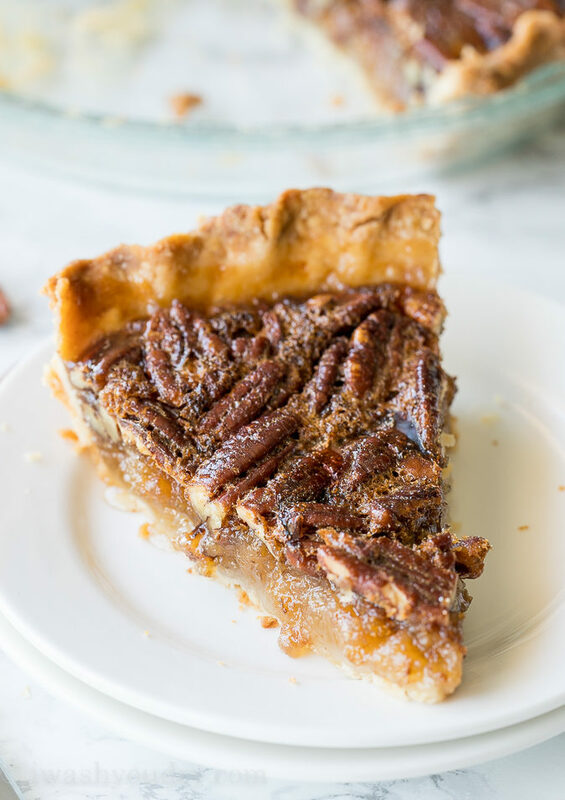 I vote for Pecan Pie on all the days of the year! 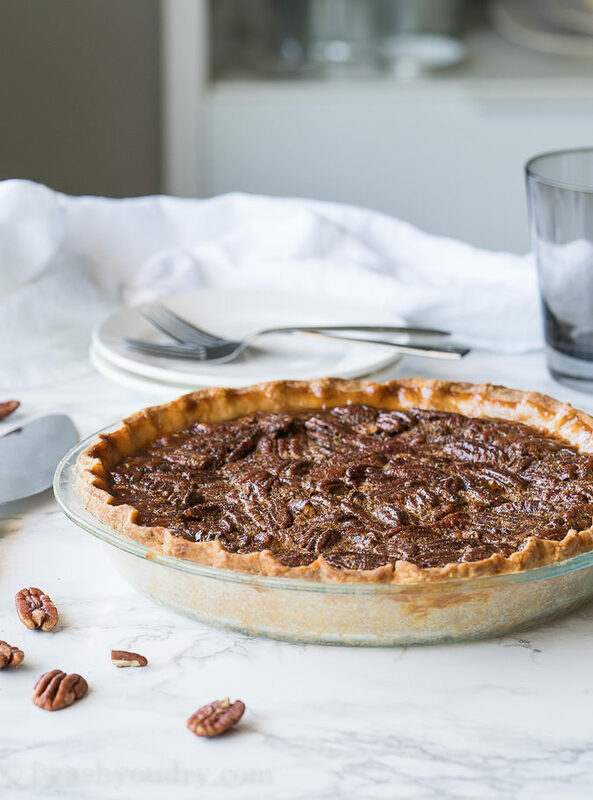 This Classic Pecan Pie Recipe is EASY to make. 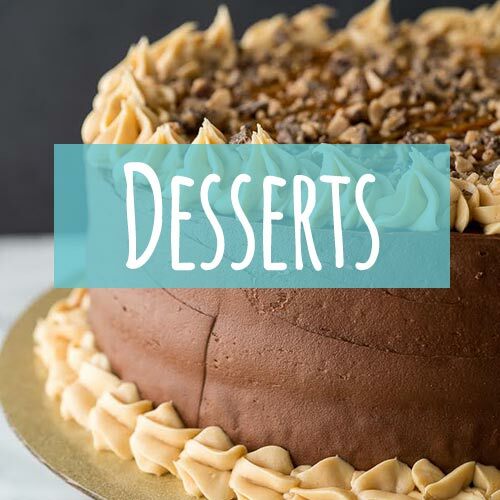 Simply whisk, bake, and enjoy! Mix the corn syrup, eggs, sugar, butter and vanilla in a large bowl with a whisk until smooth. Use a wooden spoon to stir in the pecans and pinch of salt. Pour the filling into a prepared (uncooked) pie crust and bake on center rack of oven for 60 to 70 minutes. Center of pie should spring back when tapped. If pie crust is browning too quickly cover edges of pie with foil. Let pie cool for 2 hours on wire rack before serving. Enjoy! Love it, but have started using brown sugar instead of regular. We all love that way now. I’ll have to try it with brown sugar too! Thanks Joy! 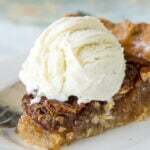 This is so close to the pecan pie I have been making for over 49 years. It is the “BEST”. It has won numerous Blue Ribbons at state and local fairs. I layer my pecans over the bottom of my crust and gently pour the egg/sugar mixture over top. Leave it sit for a few minutes and the pecans will rise to the top. The slight difference between mine and yours is: I use 1 tsp of melted butter, not 2; only one cup of toasted pecans (may switch to 1 1/2 cups); I also add 1 tablespoon of flour. Sometimes, I partially bake my piecrust to firm up the bottom crust. At times I remove the bottom rack and place the pie directly on the oven floor for 10 minutes to jump start the baking of the bottom crust. I don’t like soggy bottoms and brushing the crust with egg whites does not seem to work for me. 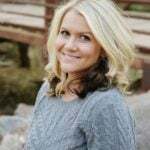 Enjoy reading your site and the recipes you post. Don’t normally make comments but had to, this pie is too good not share! !